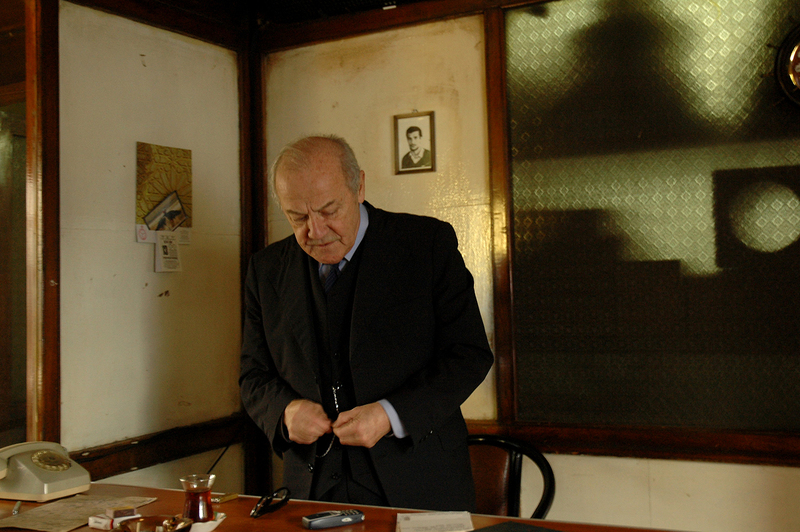 “Fikret Bey” is the story of a day of a business man nearing the end of his life, Fikret Özsoy, who has had a long, fluctuating life story. This one day takes place in Fikret Bey’s factory, which he had rented following his bankruptcy and which is now falling into pieces. The routine of this day, the 13th of October, 1988, witnesses a story of decline, a finale, a demise. Beyond regrets and disappointments, there is a son in exile and his daughter Zeynep, a young university student. Under the shadow of September the 13th, Fikret Bey has witnessed the deterioration of many values he had believed. Nearing the demise, he shares this day of October 1988 with his sentinel Mehmet until the end, together passing beyond reality. Zeynep, is both in and out of heir world. She is sad because her father’s life is inevitably ending. She can not do anything. Their lives are no more valuable than the life of their dog “Princess”, which was brutally killed by the municipality officers. Fikret Bey and the sentinel Mehmet live through an allegoric projection of the Republic of Turkey in this wretched factory. All hopes, efforts are destined to perish, just like this factory, which at its time ran full speed to produce and to contribute. We are called to witness this frozen time in a day of Fikret Bey and his sentinel. As Bazin says, the art of cinema is like the piece of cloth that Veronica offers Christ. Just as Christ’s passion reflects on this piece of cloth, the cinema gives us the opportunity to witness the passion of man. May be we can have the opportunity to understand Fikret Bey and the sentinel Mehmet, who live in a different time and space, like Don Quixote and Sancho Panza.